I can’t believe how delinquent I’ve been. Yes, yes, I know I’ve never been the most, ahem, prolific of posters but I’ve certainly never done this to you before. You see, as of today, this recipe has been sitting on my computer – tried, tweaked and photographed – for nearly six weeks. Six weeks and I’m only posting it now, can you believe it? Under normal circumstances I might take that as a sign that maybe the recipe isn’t that good after all and I’ve just been looking for excuses not to publish it, but I can assure you that’s definitely not the case here. In fact, I made it again last night just to confirm. Or at least that’s how I justified making it for a fourth time, but really, I would have taken any excuse I could find. But that doesn’t explain why I haven’t told you about it until now. Oh sure, I can blame craziness at work, and the fifteen million billion other things going on that have kept me feeling like I’m drifting in a lifeboat with a leak in it, bailing out water as fast as it comes in (among other things, the incredibly stressful business of trying to get Manuel a green card – if any of you have gone through this for a foreign spouse, please tell me: does it ever end??). But that’s not the whole of it. The problem, if I’m honest, is that I just don’t have a lot to say about this cake. I mean, there’s no interesting backstory, no tangled history, no humorous anecdote I can share about making and/or serving it. It was just something that slowly made its way to the top of the to-make list and once I did, quietly won us over. The key word here is quietly, because this cake is far from a show-stealer at first glance. It’s a plain cake, drab greyish-brown in color, and even the suggested accompaniments of whipped cream and blueberry compote do little to improve its lot in the looks department. Its flavor is also unexpectedly subtle, and easily loses its voice under more aggressive toppings. But on its own, perhaps cut in a thick wedge and eaten while leaning sleepily against the kitchen counter, the day’s first cup of strong, milky coffee in the other hand, you’ll have no problem finding its charms. Beautiful it ain’t, but spend some time alone together, and you’ll realize this cake makes up for it with some serious personality. The best analogy for this cake, I think, would be to your most comfortable pair of shoes. You know, the kind you would never dream of wearing to an important occasion, but the ones you always reach for first when there’s no one around to impress. The buckwheat, a grain that has finally begun to shake its wooly-cardigan and Birkenstock-wearing associations, is a huge part of the cake’s allure, lending it exactly the kind of rustic wholesomeness that makes things like graham crackers and digestive biscuits so appealing. Texture-wise, it’s darn-near perfect, not too light and not too heavy, its thin, slightly chewy exterior enclosing a soft, moist crumb (which you’d never guess was gluten-free! ), plenty of toasted-almond rubble and the gentle whispers of cinnamon and lemon. It’s the kind of cake that, like those comfy shoes, will become such an indispensable part of your culinary wardrobe that you’ll be hard-pressed to remember life without it. So there, now you have it, and please accept my sincerest apologies for keeping it from you for so long. Though hopefully you’re far too busy digging out your buckwheat flour to mind. This cake, as you can no doubt tell by the name, has its origins in Italy, specifically in the South Tyrol/Trentino-Alto Adige region where buckwheat is a staple crop. This particular version was inspired by a recipe in Anna del Conte’s Classic Food of Northern Italy, a fascinating compendium that includes many of the region’s lesser-known delights. Her version of this cake is more or less traditional, but as I typically like my cakes a bit moister than the Italians, I’ve tinkered with the formula a bit so that it’s just as tasty plain as it is split and filled with blueberry jam (which you should feel free to do if you want to enjoy it like the Tyrolians). Alternatively, I imagine it would be fantastic with stewed or poached apples, pears or plums, but keep their spicing to a minimum or you’ll risk overpowering the cake’s own delicate flavors. Preheat the oven to 350F/175C. Spread the almonds on a baking sheet and toast until golden and fragrant, about 10-12 minutes. Cool completely. Grease a 9-inch/23cm springform pan and set aside. In a food processor or clean coffee grinder, grind the almonds as finely as possible with 1/4 cup (50g) of the sugar. In a medium bowl, stir together the ground almonds, buckwheat flour, salt, cinnamon, lemon zest and baking powder. In another bowl, beat the butter and 1 cup (200g) of the sugar until fluffy. Add the egg yolks one at a time, beating well after each addition. Beat in the dry mixture alternately with the milk until everything is well combined. In a clean mixing bowl and using spotlessly clean beaters, whip the egg whites with the remaining 1/4 cup (50g) sugar until they form stiff, glossy peaks. Stir one-quarter of the whites into the cake batter to lighten it, then gently fold in the rest. Scrape the batter into the greased pan, smoothing the top. Bake the cake in the preheated oven for 40-45 minutes, or until a toothpick inserted in the center comes out clean, covering the top loosely with foil if it begins to darken too much. Cool the cake for ten minutes on a rack, then carefully remote the outer ring and cool completely. Store, covered, at room temperature for up to 3-4 days. Dust with a little powdered sugar before serving, if you like. Feliz Cumpleaños!!!!!!!! I love ya! Do you think one could use kamut flour instead of buckwheat in this recipe? In my endeavors to discover other kinds of flour, I have kamut sitting at home, and I am looking for recipes to use it. Thanks. Thanks for your quick answer! I will definitely let you know if I try it. And thanks also for your wonderful blog. I don’t usually post comments, but I have tried several recipes (the chickpeas with almonds, and the black olive cookies in particular come to mind). I’ve also bought the "Pure dessert" book because you raved about it (that’s why I have kamut at home!). Just lovely. So simple and delicious. Thanks.And happy blog birthday. Here’s to many more great posts ahead. I love buckwheat and I love your blog. It’s always a pleasure to read your writing, and I’m really glad you’ve kept it up for these three years.The cake looks great, like so much on your site. Thanks. Buckwheat is a must! Love it by all means. Lovely photo to celebrate a great day, eh? Well enjoy and to many many more! This is just the beginning of something big! You made a plain looking cake so very pretty in your picture. Curious about baking with buckwheat now…And happy blog birthday! Happy blog-niversary, Melissa. I enjoy reading your blog ever since I found it few months ago. oooh always a treat to see a new post from you! best of luck with the green card saga! i’ve been the Foreign Spouse and had a nightmare time last year convincing the Home Office our marriage wasn’t a sham so imagine it’s much worse when the US system is involved! I’m going to have to try this – I’m a big fan of ground almonds in cakes. This looks terrific, it really does. Oh, it looks just lovely, I love cakes made with nubbly flours (buckwheat, kamut, amaranth, etc. ), the kind you can nibble on at any time of day. Happy blogiversary! Happy Birthday! It is quite a milestone and I for one am definitely glad that you followed that whim 3 years ago because you have since become one of my most favourite people ever. 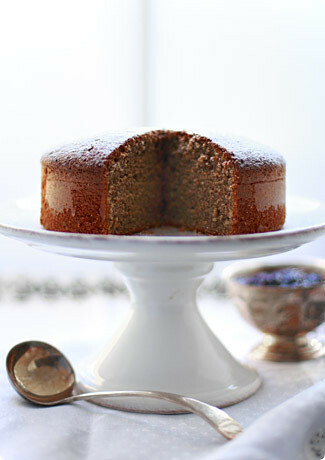 And your buckwheat cake looks lovely–so shiny and perfect! Très belle recette ainsi qu’une magnifique photo ! This is awesome! I am not allowed to have white flour and have been wanting cake! You know how it goes when you aren’t allowed to have something you crave it all the time. This is perfect for me and I am making it this week. Thank you! Do you think this would work ok with agave instead of sugar? Hi, this is my first time posting here. First, congrats! Second, buckwheat flour has been popping up all over my radar…err, computer screen…lately and just yesterday I finally bought some. I used the new food blog search to see if I could find enough tempting recipes to justify buying yet another pantry item when I’m only going to be living in my apt. for a few more months. I found a bunch of great sounding recipes to round out the few I already had my eye on. Your cake may have just squeezed its way to the top. Buckwheat and almonds and lemon, oh my– sounds delicious. Thanks! This is interesting. I don’t think I’ve ever seen a buckwheat cake before. I’ve been curious about trying some of the more interesting and unusual flours out there, and this looks like a good way to start! Good luck with the whole green card thing. While I’m not in that position myself, I’ve known a few people who have been. Argh, somehow my comment failed. I think I was supposed to verify or something. Anyway – if you need unofficial advice about the green card process, let me know. I’m a law student and I’ve studied immigration law. Happy, happy blog birthday! And I’m adding buckwheat to my shopping list right now! I so enjoy your beautiful blog and your wonderful writing, that once every three months would be enough. It’s about quality, not quantity! very nice cake, nice blog -congratulations on your third anniversary. back to the cake, such an interesting recipe. how did you make it shine, a glaze of some sort? brushed with a melted jam? i,m so intrigued. I’m definitely going to try this recipe in a few days. thanks for sharing. happy birthday!and i gladly accept your cake apology. but i would accept it even MORE if you made me one of my own. Oh memories… my friend’s mother made somethign similar to this a couple of years ago. I loved it then but never got a recipe and have never seen it anywhere since then. This looks absolutely gorgeous. That shot is perfection! I’m not a big eater of buckwheat, purely because its not something you just find floating around the supermarket around here. I did once have some magnificent buckwheat blini which have left me wanting more. It is a splendid site. I linked so that your site could visit it from my site.Please link by all means with my site. http://cookingrecipe001.blogspot.com/ Because I show various recipes, please visit the all of you. http://cookingrecipe001.blogspot.com/If a site and you that it is possible, and a big connection comes,and it was watched comment by each other by linking have you visit it,I am happy at all. And I pray for your good luck. Happy blog birthday Melissa! Time flies, doesn’t it? Hope you’re making progress with Manuel’s green card. Since I keep buckwheat flour on hand for pancakes, I thought I’d give this cake a try.It was really delicious, with a light crumb and a deep, nutty flavor from the buckwheat and almonds. I’m thinking of trying it with honey instead of sugar next time–many thanks for a great addition to my recipe box! You guys are wonderful! I’m really, really touched by your comments. Thank you.Tiffany: I use a Canon 5D. We have several lenses, but the ones I use most for food are the 50mm f/1.4 and the 100mm f/2.8 macro. Are you familiar with Lara’s Still Life With blog? She has lots of great food photography tips!David: Where do you see sunshine? You mean the cloudy sky I overexposed in photoshop? ;)Shauna: Oh, getting my residency here in the UK was a walk in the park compared to what we’re going through for a green card. Grrr…Me: I’ve actually never used agave, so I have no idea! I’d be interested to know the results if you try it, though.Judith: Wow, thanks for the offer. At the moment we’re waiting on the embassy’s decision, but if things fall through I will most definitely get in touch.Valya: No, no glaze. I assume you mean the sides of the cake, right? That was just the butter-flour residue I coated the pan with, I think. It does give a nice effect, doesn’t it?Calliope Jane: So glad you liked it! I love buckwheat and I no longer dress to impress. Thanks for posting this recipe, esp for those of us who are always looking out for wheat-free recipes. Buckwheat flour has a wonderful nutty flavour. Wow. This looks to be the most perfect looking cake ever. I just love this photo it look gorgeous. Has anyone tried modifying this recipe for a muffin pan? I live alone and whole cakes are not in the cards for me, but I’d be curious about how well this works on a small scale. Oh lo! I just cut & ate a slice. How (not) sad am I that company will not be here this evening & I (must) suffer thru this cake alone.Wow. Thank you. Now… I really do need a second slice. That cake looks yummy. For some reason, it sounds healthy, too. Maybe I’m just hungry, though. I’ve just put this in the oven 10 minutws ago and I’m waiting to see how it turn out. All done by hand & no electric appliances were used, not even for beating the eggs! Hopefully, it’ll turn out fine. It’s already smelling nice,so time will tell.Now I thought I’d relax with a nice galss of dry white, seeing as it’s a lovely evening [24 degrees C/ 75F] here in Rotterdam.Love the blog and hope you keep going for another 3 years plus. Do you think I could substitute oil for the butter? Thanks, this looks delicious – and I’m so happy it’s naturally gluten-free! Just found your blog – went straight to the word buckwheat for some reason. Always the grain… anyway. Nice to "meet" you! Beautiful photos. Wow, I just made this and it’s divine. I substituted dark muscovado sugar for the white stuff and used almond milk because I’ve found dairy gives me blemishes and it turned out wonderfully. Thank you for posting this gorgeous gluten-free cake! Late to the dance, but I just found your website the other day linked from nami-nami and I am excited to try this recipe. I think I can easily make it wheat and corn free, which has not been easy for most cakes! I’ll probably try honey instead of sugar, and soda/cream of tartar for the BP. I can’t wait to try it. Thanks for the beautiful blog, great stories and recipes. I loved your post and decided to try it right away. It came out delicious, though I cooked way quicker than I expected (let’s say we ignored the a-tad-brunt bottom:)It was delicious, I served it with fig’s jam in the middle. Thanks a lot for sharing. My son and I just finished polishing off our first slice of this buckwheat cake; it's definitely a charmer! It's nice that it's not overly sweet or rich, the texture is great and I love the flavours of the buckwheat, lemon and cinnamon; they compliment one another so elegantly!Although mine did not quite rise as much as the cake in the photo; with the domed centre. I used almond flour/meal, dark buckwheat flour and 1% milk, maybe one of those factors made a difference.I have a new favourite as a snacking cake, thanks!